ermany’s often exquisite white wines deserve wider recognition and support. Wines are now riper and cleaner and are increasingly marketed in a direct modern way with a growing number of consistently well made dry or off-dry Rieslings. More clarity is still needed in terms of what degree of sweetness to expect but there are ever more outstanding producers. Those with an established reputation have recently been joined by increasing numbers of fine, often small, newer operations. Apart from the sweet wines, which are expensive to produce and made in tiny quantities, many of the wines are very reasonably priced for the quality. There are also excellent examples of Weissburgunder (Pinot Blanc), Silvaner and other white grapes, as well as some wonderful reds from Spätburgunder (Pinot Noir). There are two basic quality levels, QbA (Qualitätswein bestimmter Anbaugebiete) and QmP (Qualitätswein mit Prädikat). Fine quality begins with the latter which includes six Prädikat (or classifications) of ripeness – for each a minimum must weight (sugar level in the grape) must be obtained. Kabinett is the lowest level and should mean a light, dry white but quality is producer dependent. Spätlese (meaning late-harvest) wines are riper – dry examples are labelled Trocken (offdry is Halb-Trocken), otherwise expect some sweetness. Auslese wines are made from riper grapes again (sometimes botrytis affected) and are usually sweeter, but Trocken versions are also made. Still riper and sweeter categories of Beerenauslese and the rare Trockenbeerenauslese (TBA) are made only from handpicked, shrivelled grapes, almost invariably enriched by noble rot (botrytis). Eiswein, high in both sugar and acidity, is made from frozen grapes which, when they are crushed, leave the water behind. Critical to quality in all levels is the balance between residual sugar and acidity. Most Prädikat wines also come from a single site – an Einzellagen name, usually suffixed with a village name (often dropped in the Pfalz). These names are emphasised in bold throughout the German section. Certain sites lend themselves to favour the production of one style but not necessarily another. Within the same Prädikat level (usually Auslese) the best parcels from a single top site (or the resulting cuvées) may be differentiated as Goldkapsel (Gold Capsule) or even Lange Goldkapsel (Long Gold Capsule), usually correlating with a greater degree of botrytis character. Alternatively small stars may appear on the label to distinguish between bottlings of increasing quality ( ‘1 Stern’, ‘2 Sterne’ or ‘3 Sterne’) Only where these are being made on a fairly regular basis have they been included within producer entries. Many of Germany’s top estates belong to the VDP (Verband Deutscher Prädikats-und Qualitätsweingüter) consortium (labels bear its emblem of an eagle) and their best and rarest sweet wines are sold at the VDP auction (as Versteigerungswein). Specialist wine merchants may stock such wines following a successful bid. The VDP has also been important in promoting the establishment of a vineyard classification system. Since 1999 an increasing number of producers have labelled some or all of their wines from the best vineyards under the top level of the classification. In 2007 this category was officially declared (if not yet legally recognised) as Erste Lage and needed to be a minimum of Spätlese must weight. Dry wines (Trocken) are known as Grosses Gewächs (already in use in the Pfalz, Franken and other regions and identified as GG on labels), or Erstes Gewächs (in the Rheingau). From the 06 vintage all Erste Lage can be recognised by a special bottle (used by some in Pfalz since 02) with an embossed symbol: a figure ‘1’ next to a bunch of grapes. In 2000, two new categories were introduced for dry wines. Both basic Classic level and premium Selection wines are varietal but the latter also come from a single vineyard. From the 2012 vintage, however, a new classification system was put in place. The top level remains Erste Lage, with the 1 next to the bunch of grapes: these are wines from the best vineyards in Germany. The vineyards are narrowly demarcated, the grape varieties are designated, the maximum yield is 50 hectalitres per hectar (50hl/ha), there is a minimum must weight (the level of sugar in the grape-juice), and the grape must be selectively harvested by hand. Fruity wines with natural sweetness are denoted by the traditional Prädikats, as set out above, whilst dry wines are labeled Erstes Gewächs, if the wine is from the Rheingau region, or Grosses Gewächs if from the other regions of Germany. The second level of classification is Klassifizierte Lage/Ortswein/Terroirwein, which are wines from classified wines of ‘Superior’ quality, from a small group of traditional vineyards, with a maximum yield of 65hl/ha. The lowest level is Gutswein, with a maximum yield of 75hl/ha. When looking for good-quality wines from Germany, avoid wines bearing a village name in conjunction with a Grosslage name (looking much like the name of a specific site but actually referring to a broader sweep of inferior vineyards). Piesporter Michelsberg and Niersteiner Gutes Domtal are infamous examples that have been allowed to demean the reputation of a fine village and mislead the consumer. The Mosel, as it is now officially known, also incorporates wines from two tributaries, the Ruwer and the Saar (the latter can still be used on labels). Riesling is king here and the top wines are almost exclusively from this grape. The vines are planted individually on often perilously steep slopes above the exaggerated twists and turns of the river below. The river Mosel flows along the Luxembourg border (here Moselle – see Other Europe) before turning towards Trier and it is almost immediately joined by the most important tributary, the Saar. Viticulture is marginal but the wines can be extraordinary. In the best years (plenty of those recently), and only then in the best sites, are sublime steely, minerally wines made, sometimes with piercing acidity but developing a marvellous, vibrant, honeyed intensity with age. Farthest from the Mosel are the vineyards of Serrig, most notably Schloss Saarstein; downstream Saarburg is distinguished by the Rausch vineyard. These, like most of the top vineyards, lie obliquely to the river. Further downstream are Ockfener Bockstein, the Kupp vineyard from behind Ayl, and Scharzhofberg from one of Germany’s great names, Egon Müller. The village of Oberemmel and its fine vineyards, including Hütte, lie in a recess away from the Saar and are often overlooked. Braune Kupp by contrast is on the river itself, north of Wiltingen, as is Altenberg, another great site, opposite the village of Kanzem. The Ruwer is a trickle by contrast with the Mosel but boasts some exceptional sites that produce exquisite, elegant wines in exceptional vintages. In the village of Kasel are the fine Kehrnagel and Nies’chen sites but the greatest vineyards are those of Eitelsbach, with Karthäuserhofberg and the Abtsberg vineyard of Maximim Grünhaus/von Schubert. Obtaining full ripeness (and thus potential greatness) on the Mosel proper is a problem, and only in its middle section, the Mittel Mosel, are the great gems of Mosel viticulture consistently superb. Travelling downstream from Trier, opposite the village of Leiwen, the very steep Laurentiuslay is the first fine site, from which several good interpretations are made. Trittenheim’s best vineyards are Leiterchen and Apotheke, which can show a cool, delicate minerality, but the really outstanding sites in this section of the river are the south-facing vineyards either side of Piesport, Goldtröpfchen and Domherr, which can show a marvellous intensity of blackcurrant, peach and citrus fruit. Kesten marks another fine stretch of vineyard beginning with Paulinshofberg and culminating in the Juffer and, especially, the Juffer-Sonnenuhr sites opposite the village of Brauneberg. These wines show a marvellous mineral intensity from a number of top growers. Between here and Bernkastel are some good vineyards around Lieser (Niederberg Helden) and Mülheim (Helenenkloster) but the most impressive are on the dramatic steep slopes that run northwards along the Mosel from behind Bernkastel. These begin with the small celebrated Doctor vineyard, Graben and Lay, but stretch on to Domprobst, the great site of Graach, flanked on either side by the fine Himmelreich and Josephshof vineyards. The same great slope then continues with the Sonnenuhr vineyard opposite Wehlen, which extends as far as Zeltingen. Many of the Mosel’s finest producers are located in this section and wines from the likes of Willi Schaefer, Dr Loosen, Markus Molitor, Joh Jos Prum, Max Ferd Richter and Selbach-Oster offer high quality but differing interpretations. The Bernkastel wines can tend either to be very expensive without always showing their full potential or, as this is a much misused name, have little to do with the great vineyards behind the village. Two Grosslage names to be aware of are Badstube (often fine as it is restricted to the best sites) and the much wider Kurfürstlay. Just downstream of Zeltingen is arguably the last brilliantly exposed segment of the Mittel Mosel. The last two great village names are Ürzig, with its famous Würzgarten (‘spice garden’) vineyard, and Erden, which lies opposite the almost sheer Prälat and similarly south-facing Treppchen vineyard. The last stretch of the Mosel before it reaches the Rhine at Koblenz is known as the Terrassenmosel for its narrow terraces. Though not held in the same esteem as those vineyards in the Mittel Mosel, there is undoubted potential here beginning to be realised by a number of small growers. In particular, quite powerful, minerally examples have been realised from the Röttgen and Uhlen vineyards of Winningen. The scattered vineyards on the picturesque north-running stretch of the Rhine constitute the small region of Mittelrhein. They can be seen both north and south of Koblenz but the best wines come from a handful of producers around Bacharach which has several good sites with slatey soils. As in the Mosel, Riesling is king and good examples have a distinctive floral, mineral intensity. The Nahe has more land planted to vineyards than the Rheingau but much less Riesling, yet its best examples can combine the best qualities of both the Mosel and Rheingau. The greatest stretch of vineyards lies south of the spa town of Bad Kreuznach. The town itself has potentially outstanding sites in Kahlenberg, Krötenpfuhl and Brückes but, though improving, quality has not been maximised. Most famous are the vineyards of Niederhausen, especially Hermannshöhle. Dönnhoff is a brilliant producer which has also underscored the quality of Brücke (associated with Oberhausen, across the river) and Kupfergrube, which along with Felsenberg is one of the great vineyards of Schlossböckelheim. The village of Norheim has good south-facing sites in Dellchen, Kafels and Kirschneck while Traisen has Bastei and Rotenfels but this section of the Nahe needs others besides Dönnhoff to make more of its inherent potential. Bockenauer Felseneck on the Ellerbach tributary is another great site which sparkles in the hands of Schäfer-Fröhlich who, along with Emrich-Schönleber, also produces refined Rieslings much further upstream on the Nahe, at Monzingen – from the Halenberg and Frühlingsplätzchen vineyards. Downstream from Bad Kreuznach, and nearer to the Rhine, is Dorsheim, where the top sites of Burgberg, Goldloch and Pittermännchen show good richness from Schlossgut Diel. The Pittersberg, Dautenpflänzer and Rheinberg sites of Munster-Sarmsheim can also be a source of good quality Riesling. One glance at a map of German wine regions makes it obvious why this particular region has been held in high regard for so long. Tight contours above the Rhine, as it swings west south-west for 30 km, indicate an ideal swathe of vineyards, some of which have long belonged to some of Germany’s most aristocratic estates. Despite the potential, quality remains mixed and is as likely to come from an emerging smaller grower with less well-known sites as from a more famous name. As the river starts to swing north again, Spätburgunder is planted in the Höllenberg vineyard above Assmannshausen but Riesling otherwise dominates these vineyards as in no other German region. In the main section, where some of the leading villages are to be found, the vines stretch well back from the river. The best wines show a riper, richer fruit intensity that contrasts with the generally lighter, more elegant examples from the Mosel. The citrus, apple and white peach flavours more prevalent in the Mosel are replaced more often by peach, nectarine and apricot, even at Kabinett and Spätlese levels of ripeness. Rudesheim’s best vineyards lie opposite Bingen almost directly above the river, Berg Schlossberg and Berg Rottland on the steepest slopes are the finest but several others can also produce high quality. Moving east, Geisenheim, famous for its wine school, includes the vineyards of Kläuserweg and Rothenberg, while perched high above it is the historic estate of Schloss Johannisberg with its own separate Einzellage identity. Behind the neighbouring village of Winkel, Schloss Vollrads too is an Einzellage in its own right and efforts are being made to restore its flagging reputation. Winkel also has two fine vineyards in Jesuitengarten and Hasensprung. Further east, Oestrich deserves to be better known as both the Doosberg and Lenchen sites can provide top-quality Riesling in the right hands (Kühn or Spreitzer). The village of Hallgarten lies high above Oestrich but it is only with Hattenheim and Erbach, from vineyards close to the river, that better sites are found. Hattenheim includes Wisselbrunnen, Nussbrunnen and, in Mannberg, has the extension of Erbacher Marcobrunn, from which some of the Rheingau’s most powerful, flavoursome Rieslings can be made. Erbach also includes fine sites in Siegelsberg, Schlossberg and Hohenrain. Kiedrich lies a long way back from the river but has steep slopes in Grafenberg and a high-profile producer in Robert Weil. The vineyard of Wasseros also has the potential for top quality. To the east of Kiedrich is Rauenthal, a village from which stylish, spicy, minerally Riesling can be made from several outstanding sites. Until very recently at least the potential of Baiken and Gehrn has not been realised while fine examples of Nonnenberg and Rothenberg from both recent and older vintages can be found. Neighbouring Martinsthal (Langenberg) and other villages closer to Wiesbaden also contain fine if lesser-known vineyards such as Wallufer Walkenberg. At its eastern end, the Rheingau vineyards are not on the Rhine at all but on the river Main as it flows west into the Rhine. Hochheim includes several top sites from a relatively narrow wedge of vineyard, including Domdechaney, Kirchenstück and Hölle. Germany’s most extensively planted and productive region is also the source of a significant amount of its poorest wine. The leading grapes are Müller-Thurgau and Silvaner, much of it destined for oceans of bland semi-sweet blends. It is yet again Riesling grown at the Rhine’s edge that produces the best wines. Bingen, in the region’s north-west corner, at the juncture of the Nahe and the Rhine rivers, has one important vineyard, the Scharlachberg, but it is a famous stretch of vineyards from around Oppenheim and up to Nackenheim that produces the great Rieslings. The steep east- and southeast-facing escarpment of the Roter Hang hill that runs from behind Nierstein towards Nackenheim includes most of the top sites, particularly those on the sweep of the Rhine itself. Fine Niersteiner vineyards include the Orbel, Heiligenbaum, Ölberg, Hipping, Brudersberg and Pettenthal, while Rothenberg (whose top producer is Gunderloch) comes under Nackenheim. Behind Oppenheim (like Nierstein, sullied by a Grosslage name), lie Herrenberg and Sackträger, two more potentially outstanding sites. At Flörsheim-Dalsheim, in the southern hinterland, Weingut Keller has highlighted the potential of this area and established the reputation of the Dalsheimer Hubacker vineyard, while to the north the Wittmann family are forging a reputation for the best vineyards of Westhofen. Riesling is the most planted variety in the Pfalz but occupies only 21 % of the vineyard, so there are many other grapes that assume an important role here as well. There is very fine Rieslaner and excellent Scheurebe and the wines are noted for a lush richness checked by a vibrant acidity. Good examples of the ‘Pinots’ – Grauburgunder, Weissburgunder and Spätburgunder – are made too. The Pfalz is effectively a continuation of Alsace, and the Haardt mountains offer similar protection to the Vosges, often ensuring a sunny, dry autumn. The region’s best producers are no longer confined to the Mittelhaardt, a rich vein of sites made famous by Bassermann-Jordan, Bürklin-Wolf and von Buhl. On hillside slopes on the western edge of the villages (running northwards) of Ruppertsberg, Deidesheim and Forst are some of the finest sites. 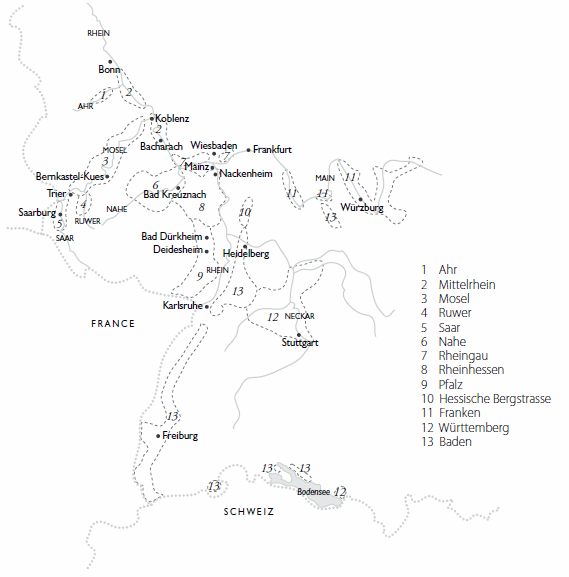 The best from Ruppertsberg include Gaisböhl, Hoheburg and Reiterpfad, while those from Deidesheim include Hohenmorgen, Leinhöhle, Kieselberg, Kalkofen and Grainhübel. Forst has two outstanding sites in Jesuitengarten and Kirchenstück but also Freundstück, Pechstein and Ungeheuer. The last fine sites in this stretch are clustered together just south of Wachenheim and includes Gerümpel, Goldbächel and Rechbächel. From here the vineyards continue virtually unbroken and north of the spa town Bad Dürkheim, from close to Ungstein (Herrenberg) and Kallstadt (Saumagen), there is still more potential for outstanding wines. Many producers now make a Riesling Spätlese Trocken from a top site and label it as Erste Lage (previously Grosses Gewächs) in the manner of an Alsace Grand Cru. A growing number of good producers make fine Rieslings from outside this particularly well-protected belt. The most high-profile of these, Müller-Catoir, is as successful with Rieslaner, Scheurebe and Muskateller as with Riesling. This fast-growing, resurgent region (now Germany’s third most important in terms of quantity), lies directly across the Rhine, here forming the border with Germany, from Alsace. Production is dominated by large co-operatives but exciting small, private producers are more responsible for its growing reputation for quality. Though a quarter of the planting is Müller-Thurgau, the leading variety is red. Spätburgunder (Pinot Noir) accounts for almost a third of the vineyard area. Grauburgunder (or Ruländer as it is also called here) and Weissburgunder in both oaked and unoaked styles are also important, as is Traminer. From this elongated stretch of vineyards, those from the areas of Kaiserstuhl and Ortenau produce some of the finest wines. In Kaiserstuhl’s volcanic soils all three ‘Pinots’ do particularly well from around the towns of Achkarren, Burkheim, Ihringen and Oberrotweil. Further north, Riesling (as Klingelberger) assumes some significance in Durbach (especially from the Plauelrain vineyard) and in the Ortenau, where the quality obtained by Laible suggests its true potential is only just beginning to be realised. In Franken, as in the Rheinhessen, the variety that dominates production is Müller-Thurgau, though not from a quality perspective. Silvaner is the most important quality grape and Franken is where this grape shows the greatest interest and complexity. Riesling hardly figures at all, in part because the more continental growing season isn’t always long enough to achieve full ripeness. Yet from certain locations, usually close to the broad, snaking Main river, it shows a style and complexity that owes something to the soils (often limestone-rich) as well as the grape. Escherndorf has one outstanding site, Lump, where brilliant wines from Horst Sauer, including Riesling and Silvaner, deserve the widest recognition. Iphofen to the south is blessed with excellent vineyards in Julius-Echter-Berg and Kronsberg. Other locations with good sites include Würzburg (the famous Würzburger Stein) and those of Randersacker (Sonnenstuhl). Top grower Paul Fürst (Rudolf Fürst) showcases the quality of Bürgstadter Centgrafenberg Riesling and Spätburgunder while Fürst Lowenstein is a leading advocate of Homburger Kallmuth. If the squat Bocksbeutel bottle comes as a surprise, and is more difficult to pour from, don’t be dissuaded from trying the quality inside. Good Spätburgunder is made in the very small region of Ahr, named for a northerly tributary of the Rhine, while the modest amounts of wine produced in Hessische Bergstrasse is mostly Riesling. There are substantial vineyards areas in Württemberg where reds are as important as whites, and increasingly good quality, if from a select number of producers. Wine quality from the small Saale-Unstrut and Sachsen regions, at the extreme northern latitudes of continental European viticulture, has improved since Germany’s reunification, but there are no stars yet.